This book is a dystopian look at a reality show that takes place centuries from now. The United States is no longer and the country (Illea) is now a monarchy. However, when the King's son becomes of age, there is a contest in which all the women in the land can put their name in to try to become the wife and future queen of the country. In the new country people are separated by castes. Ones being the richest and eights being the downtrodden and generally persona non grata. Our protagonist America Singer (caste 5), has a formidable if annoying mother, an older sister who has left the house with her husband and soon to be expected baby. She has an older brother who has abandoned the family to make his own riches and a younger brother who's skill has not quite made it known. America is known for her voice and her ability to play various musical instruments. With that in her background, she is never without work. However, she has fallen in love with a young man who is one caste below her. That presents a problem because people don't marry down and her mother would crucify her if she knew about it. The love story between America and Aspen is as wholesome as apple pie. Although they would like to take it that one step further, it is against the law. With the King's son coming of age, the biggest news is that all girls between the ages of sixteen through twenty are strongly urged to fill out a census to become a true daughter of Illea. America doesn't want to fill it out and is forced by her mother. It doesn't help when Aspen suggests that she fill out the form. I really liked the relationship between Aspen and America, I was completely rooting for those two love birds to figure out a way to stay together. When the news arrives that America is selected to partake of the festivities at the palace, and with Aspen acting cruelly toward her, she does everything she can to forget the one that she loves. If you've ever seen The Bachelorette, then you'll pretty much understand how this "contest" is played out. The girls are each paraded around the Prince, they each have dates with him and he decides who he wants to spend time with forever. However, America has other plans. She's not happy to be at the castle and on her first night pretty much disobeys orders to not leave the inside of the castle. Becoming claustrophobic and missing Aspen, she tries to run out into the garden for breath of fresh air. However, her act of defiance is slowed by the palace guards. When she is granted access to the gardens by the Prince himself, she manages to somehow insult him and a perhaps ruin her chance at even competing in the Selection. However after breakfast when the Prince meets with all the girls, and America has apologized properly, he finds himself drawn to her. America strikes up a bargain with the Prince that she will help him navigate the pretty girls if she is allowed some freedoms. I liked the relationship that developed from simple teasing and flirting between Maxon and America. As much as I really want Aspen and America to continue on, I really found myself falling for the Prince. He's not pretentious like most guy would've been, but he can be royal when necessary. He does take several hard lines with America when she does not obey. Throughout the contest the castle is constantly at siege by people who don't want a monarchy and those who just rebels. Prince Maxon has some brilliant ideas, but is constantly shot down by his father. As America becomes more of a confidante, the two of them develop a relationship that may or may not be love. With a twist that I never saw coming, it really leaves the story up in the air for the next book which will probably be out sometime next year. Also, the CW has a pilot in the works with Aimee Teegarden as America Singer. William Moseley (of Chronicles of Narnia fame) is Aspen and Ethan Peck (Gregory Peck's grandson) is Prince Maxon. You bet your bitty I'll be watching! 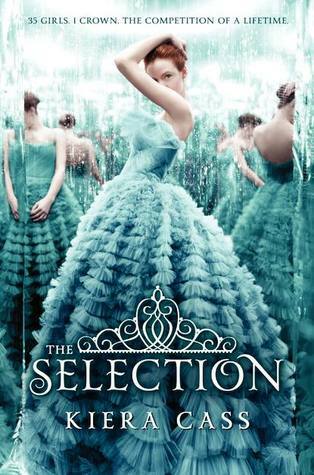 The Selection is enchanting and amusing the whole way through! I constantly needed to have this book in my hands!